Right at the beginning of the new year 2019, we are pleased to introduce you to our range extension of the pneumatic clamps product family. Greetings from the Black Forest! Pneumatic swing clamps are used when the clamping point for inserting and removing the workpiece must be freely accessible from the top. During the clamping action, the arm is first swiveled by 90° and lowered, followed by the linear tensioning motion. The workpiece clamping must take place within the clamping stroke. The swing clamps are available with different clamping arms in block version GN 875 or with screw-in thread GN 876. Tube clamp connectors are clamping elements which are easily and quickly combined into functional systems using commercial round or square tubings. All tube clamp connectors are available in aluminum. Depending on design variant and use, they can also be supplied in stainless steel. The matching construction tubes (round or square) are available in steel, stainless steel and aluminum. Visit us at the trade shows in February to see our new products. Bring our competence in standard parts to you. 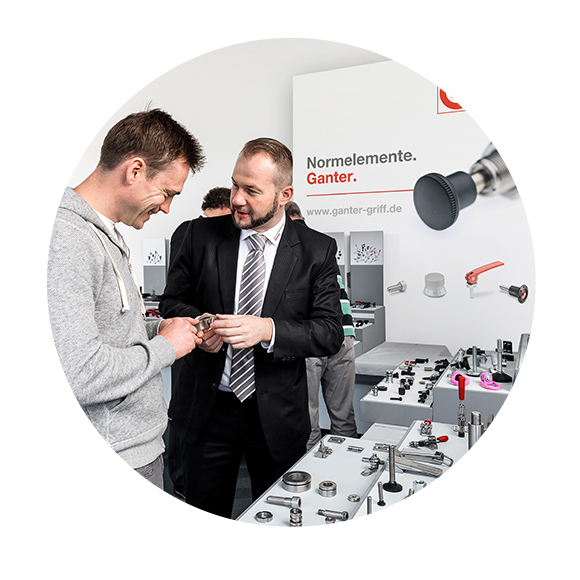 Take advantage of the opportunity to learn about the quality, diversity and consulting competence of Ganter with an in-house exhibition at your location. Naturally with no commitment or expense for you! Responsible for the contents is Axel Weber.